With the holidays season here, I want to look my best. We went to ma's mom's house for Thanksgiving. The first words out of her mouth were "oh goodness Carma, you look beautiful!" That sure made me hold my head up higher! I have gotten so many compliments since I went to visit my groomer at PetSmart. Sarah was home from college and we had a wonderful time. She kept petting me because she said I was so soft. Can't stop petting me can you? I am so soft. I have been back to get a touch up. I get my face and feet shaved. I visit my groomer every two weeks for the touch ups. It helps me look my best in between groomings. What ma loves most about that is it is a walk in service. You don't need an appointment because it doesn't require a bath. Ma can grab the items she needs while I am being touched up or she can sit to rest while she waits for me. It takes my groomer 10-15 minutes to do 4 paws and my face. Ma better not be shopping without me! Ma can do my face pretty quick but when it comes to the paws , it can take her a hour. When grooming poodle feet, you have to shave the hair on top, in between the toes and the bottom of the feet. It can be a chore for someone who doesn't have a grooming table or a sharp blade on their trimmers. Emily can get it done in no time and she can tell ma if I have any problems going on with my feet. That is another reason I love my groomer. She knows my body and can feel or see things that ma may miss. She does a assessment on me before each groom or touch up. 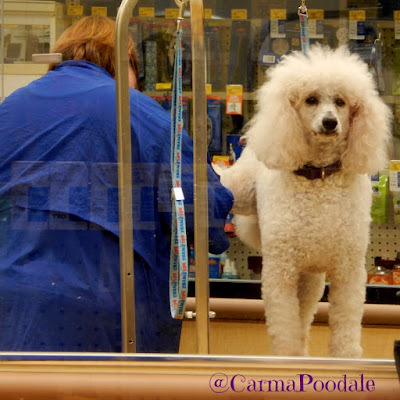 With the “Look Great Guarantee,” which is PetSmart's promise that you'll be happy with your pet’s service, or they will do whatever it takes to make it right – including offering your money back. Trust me, they will try to do what it takes to make you happy with your groom. Ma wants my forehead shaved when I have my face shaved. The standard poodle shave is from below the eyes and down, leaving the forehead hair to grow as the floof. A floof is what we call the topknot. Once I had my face shaved and when ma come to get me she seen the forehead was not done. She requested Emily to put me back on the table and shave my forehead. 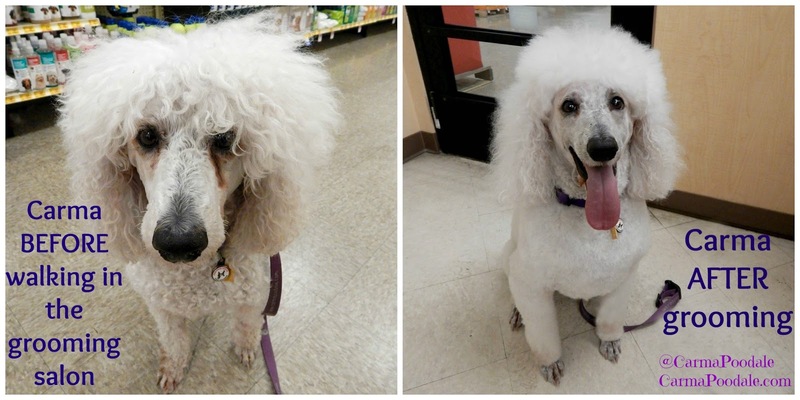 Emily ever had that request for a poodle shave. She explained to ma why that hair was to stay. Ma explained that was my Kissy spot. She wanted to kiss forehead and not hair. Once ma explained it, I was back on the table before I knew what happen. Emily shaved my forehead and asked ma if she was happy with it. Ma gave me a kiss on the forehead and said "PERFECT!" Since then ma doesn't have to remind Emily to shave the forehead. She remembers every time. That is a great sign that your groomer cares about how you look and cares that you are happy with your groom. I know that since the holidays have begun that things can really get hectic. One of the services that PetSmart offers is Online Booking. -You can book an appointment online (even choosing your favorite groomer) and get text alerts or emails notifying you when your pet is ready to be picked up. I like hearing my name over the store speakers. tee hee. 99% of the time, ma is sitting in front of the glass waiting for me. After I get groomed the walk to the front register to pay makes me feel as though I am walking the red carpet. I hear the people who are shopping saying how pretty I am or how great my haircut looks. That makes me very confident. I also love the fact that with the holidays approaching that their walk in services are just what I need to keep looking my best. 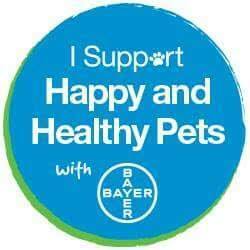 They offer ear cleaning, teeth brushing, clipping or grinding the nails, Nail polish, and so much more! You can search the PetSmart grooming site to see what is available in your area. They even GROOM CATS! See what services they offer for your cat . There are some things that I need to tell you before you go. Rabies vaccination needs to be administered 48 hours prior to service. We do not perform services on pets 8 weeks or younger. I love my groomer. She helps to keep me looking my best and always picture perfect. She also tells ma about the different products they use on me such as which comb to use, what not to use and she has a poodle! 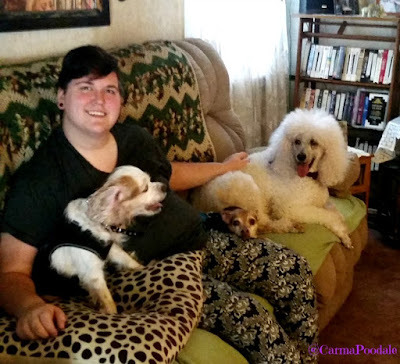 She knows poodles, she knows other breeds. She is not only my dog groomer but she is also the instructor for the new groomers. Did you know that ALL PetSmart salon associates acquire annual safety certification and take additional course-work where they learn about dog anatomy, signs of stress and common pet medical conditions.Their groomers (those that give haircuts) receive an additional 400 hours of hands-on training? You can keep up to date with all that is happening at PetSmart by following them on their FaceBook page, follow them on Twitter, they are even on Instagram. 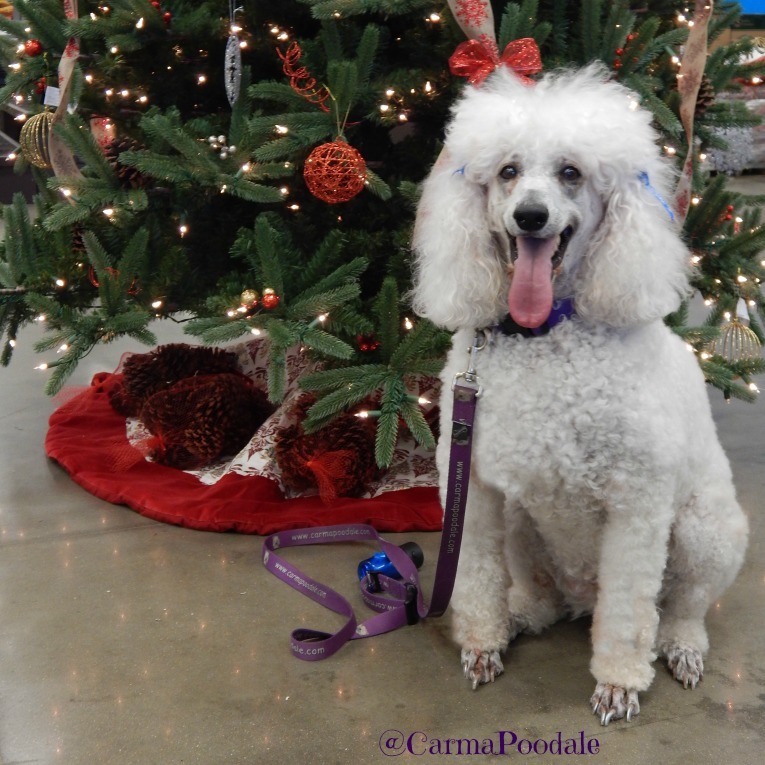 If you want your dog to look their best for the holidays or even after the holidays, book your appointment today. You can book online, book in the store or call them on the floor. 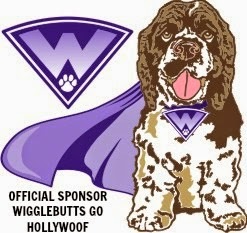 Talk to a groomer to see what they can do for your dog. I know I am ready for the holidays! I even smell like sugar cookie. Ma bought a bottle of the sugar cookie spray to keep me smelling good all season. 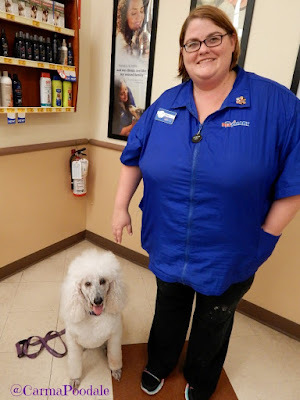 I know you seen at the top of this post that I said I was being compensated for telling you about the PetSmart grooming services but if you follow me on my Facebook page , you have seen me check in at PetSmart grooming salon all year long. I honestly use their services. They have my Poodale Approved stamp of approval. I am just blessed enough to be chosen to be able to make some jerky money for talking about something that I already do. Will you be booking a grooming session with PetSmart grooming?? Thank you. The kissy spot is very important. Nothing better than getting kisses from ma. Ms. Emily did a very nice job. Can't seem to get my local PetSmart to not give Sam a ridiculous mohawk on his topknot which looks too goofy on such a 'dignified' Standard Poodle. Sigh. Have you discussed how you want his topknot to look? My topknot is semi rounded but not a standard clip. Since I prefer the Einstein look, it has to be clipped a certain way. My hair is totally brushed out but after a few head shakes it lays like I like want it to. The person grooming Sam needs to trim him the way you want. Not what they think they want him to look like. Looking good! Touch ups are a great idea, especially for a dog who is as busy as you.